The evolving status of commerce and use of currencies relates directly to the global movement of people’s diaspora in which the Filipino diaspora of migrant labor ranks as one of the largest – next to Mexico. Acting on the people’s inherent cultural tradition of carrying irrevocable filial connection anywhere, the business and finance sector was quick to map out a strategy and create a business construct of ferrying, converting and delivering currencies from any point A on earth to any point B regardless of distance and whereabouts. It could perhaps be said that the OFWs created the demand for this type of service. When banks fell short in responding to the need for easy, immediate transfers due to rigid rules and policies, OFWs trooped to money transfer agents. These days, one can wander off anywhere in the Philippines and find money transfer agency handlers everywhere, with Western Union leading the popularity contest. If there ever has to be one. During the launch of a new service variant made available by Reggie and Celso Iglesias with their Manila Trading outfit on August 8, 2015, I had a chance to get curious. Use of money transfer agents, it turned out, is not a new. Western Union, for instance has been on operation for 135 years and has its head office in Denver Colorado. It currently operates in 200+ countries. According to Simon Millard, Australia is a major area of focus of its Philippine operation. It also operates a foundation that provides charity outreach and promulgates education in places of its operation. During the calamity wrought by typhoon Hayan, Simon said that the company donated approx. 2.5 M to the victims. As further proof of the company’s growing expansion of its operations in the Philippines, it will soon be in tie up with BPI to speed up remittance releases in matters of minutes. Direct Flights is a travel booking agent on line which operates in tie up with Western Union. CEO Nay Tran has strong connections with the Philippines. He arrived with his family in Mindanao as refugee when he was 11 years old. After a year in Mindanao, the family moved to Palawan and lived there for two years before they moved to Australia on refugee visa. He has since strove to become the successful entrepreneur that he is today. Security is a primary consideration and for people wanting to send money by remittance, legally proof of identification is required. A passport for non Australians or Drivers License for Australian citizens are usually the favoured proofs of IDs. The WU operations launch at Manila Trading was a nicely presented event. Three executives flew from Sydney to launch the operation: Simon Millard, Sydney based Western Union Country Director for Philippine operations; Danny Hoang - Business Operations Manager for Direct Flights and Direct Flights CEO Nay Tran. It was a community-friendly affair that perfectly suited the psyche of the Filipinos in Adelaide. The news of the Western Union Pinoy operation at Manila Trading has been very well received, with many enthusing their positive endorsements. And as it happens in the community, before the day ended, the news has already began to spread. At her grand age of 90, she exudes that priceless gem of peaceful radiance that life bestows to those who have given their all to life and have become one with its essence. 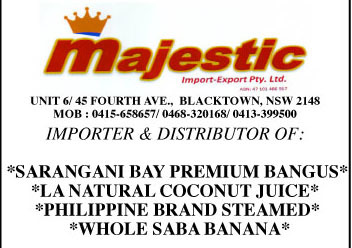 She is a highly respected member of the Filipino community in South Australia, the matriarch of the Calabio family. Mrs Calabio, author, professor, educator, mother, grandmother and great-mother was one of the earliest Filipnos to arrive in Australia in the 70s. Known as Manang Linda to a few, and Mrs. Calabio to most, this enduring and most cherished Filipino-South Australian grande dame celebrated her 90th on August 15, Saturday. A celebratory ecumenical service was offered in her honour at St. Bernadette’s Church, St. Mary’s, Metro Adelaide. The mass was followed by an evening dinner and a grand celebration hosted by her family at The Junction along Anzac Highway. It’s the 18th year of the South Australian Living Artists Festival and this year’s artists participation is a whopping 5,205 in 610 exhibitions and events. The artists’s works are of contrasting genres that are reflected in their styles and subjects. Kerry Wagner (Australia) is an intense artist whose robust works this year were inspired by her recent travel to Asia (Nepal). Norma Hennessy (Philippines) focused on art-deco subjects in both her ceramic works and on her more recent paintings. Jim Hay (Scotland) is a seasoned artist who has exhibited in many high-end art shows in various art capitals and cities in the world. This joint exhibition is the second time that the trio, all award-winning on their own, presented a selection of works under the same title. The SALA event, Gallery M at the Cultural Centre of Marion also exhibited works of Red House Group artists under the title ‘Transition’. The exhibition is from August 7 to August 30. Sunday: I jogged the 10 k distance from home to the city to meet up with Ging Tadiar and Nita Lacar-Portman at the South Australia State Art Gallery at 10 AM. The current exhibition was “Treasure Ships: Art in the Age of Spices”. It was an exhibition meant to present the complex artistic and cultural interactions between Europe and Asia from the sixteenth to the nineteenth centuries - a period known as the Age of Spices. The thought brought back memories of elementary and high school history – when we would memorize dates, names and events without quite appreciating what we read in a deeper context. Perhaps at the time, we just presumed on the basis of what we might have read and imagined. For how can someone like me, born and reared in the mountains, be enchanted by the essence of not being on land or draw keen appreciation about an odyssey at sea when the only experience I had of the sea was viewing the blue waters from a distance? Those were during the times when my family would travel from Baguio down to Naguilian and the sea in the distance would fuse with the blue of the sky, flashing by in the wind between peaks of mountains as the bus we were on navigated along the winding Kennon Road. The sea would become more real along the coastal road in Narvacan, Ilocos Sur where I came to associate the sight of splashing surfs onto the stretch of a sandy shore with palm trees casting long shadows on balmy summer afternoons. That was then when Moluccas meant more to me like grains of mung beans grouped together to represent islands on an earthen globe. And I don’t even remember anymore how I came to associate Moluccas with mongo beans. I might have learned a lot more from then. Experienced a bit more of the sea beyond dipping my toes on the sand where the surf has just splashed. It was a full-on day. The ancient maps used by the ancient navigators were browned with age. I gazed at them with my millennium spectator’s eyes and wondered how the eyes of the 16th century spectator would have perceived them. They were ornate. The artisans and cartographers of yore were amazing with their intricate detailing of their drawings. It was humbling to see such splendid artistry. After lunch at the gallery, we walked the 5 k distance between the Art Gallery and Nita’s home in Prospect, passing by a North Adelaide cafe for coffee and dessert. Dinner at Nita’s, consisted of Bacarra-style pinakbet topped with grilled fish “sagpaw” (topping), sliced roast beef in goulash gravy, shrimps sautéed in butter with mushrooms and peas, Ilocano tomato side dish of sliced tomatoes, patis, diced spring onion leaves and bulb, ginger and steamed rice. It was thus that this Sunday went by and in the process, it sloughed off the mungo bean association that my brain habitually attached to the name “Moluccas”. My first reaction was, ‘Duh!’ Perhaps it was my nationalistic, patriotic, sentimentalist pride that made me frown on such observation. Recovering from that momentary ‘cloudy-mind’-moment, I confronted my own thoughts. I was not going to be a goose burying its head in the sand. Afterall, haven’t I just posted in my social media account a sour-graping recall? But I guess, that’s beside the point. Getting back to Lee Kuan Yew’s alleged statement, I realized how straightforward it was. It was an analytical statement of someone who did not have anything to gain by stating the truth. And it dawned on me that I was squinting. I was squinting with both my eyes and my heart. Indeed! Nothing works, nothing changes, nothing happens in any place where rules, policies and laws are meaningless because the discipline to make them work is a fallacy! I’d go back to pre-Hispanic status because deep in our psyche is rooted to our parochial and tribal sense of belonging. The forging of our tribes into a ‘national’ identity that our people did not have any inkling of what it was by the conquerors became an external role that was dressed up with western influences. But our core never changed. We are tribal. Parochial. We need a strong and firm hand to lead and yes dictate us. Today, with over 100 million Filipinos needing a patriarch or an ‘Apo’ or a ‘Big Manong’, the government system needs to change. "In acknowledgement of the participation of women in the social, economic and educational life of South Australia, the Irene Krastev Awards for women from culturally and linguistically diverse (CALD) backgrounds is presented to a woman from a migrant or refugee background, who has made a significant contribution to the community. Qualities that the award seeks to recognize, value and commend include community involvement in South Australia, participation in community activities, achievements in community work, leadership in women’s groups and volunteer work with women. The award is convened by the Migrant Women’s Lobby Group of SA and it is given out at the annual IWD Luncheon which has been in running for more than 15 years. This year’s Irene Krastev Award was presented by former Minister for Multicultural Affairs and now Chair of the Multicultural and Ethnic Affairs Commission the Hon Grace Portolesi." workforce environment, women have yet to enjoy a better share of involvement in shaping the future of the evolving world. In her message to the world in this occasion, UN Women Executive Director Phumzile Mlambo-Ngcuka said “ Achieving equality in the workplace will require an expansion of decent work and employment opportunities, involving governments’ targeted efforts to promote women’s participation in economic life, the support of important collectives like trade unions, and the voices of women themselves in framing solutions to overcome current barriers to women’s participation, as examined by the UN Secretary-General’s High-level Panel on Women’s Economic Empowerment. The stakes are high: advancing women’s equality could boost global GDP by US$12 trillion by 2025.” In South Australia, it was during the International Womens Day that awards honouring 2 great South Australian women, Irene Bell and Irene Krastev were given out along with the Young Women’s Community and Spirit Awards. Irene Bell was born in Alberton, South Australia in 1906 and died in 1995. She was a member of the International Women’s Day Committee for more than 35 years. She was the Honorary Secretary in 30 of those years. She was instrumental in raising the status of women in the community. Irene fought tirelessly for the unemployed, personally helping many of them with no thought for her own welfare. She campaigned for women’s rights and supported women taking their place in Parliament and local government. The Irene Bell award in her honor was shared this year by four outstanding South Australian women: Frances Bedford, MP, Erica Majba, Dr. Wendy Abigail and Steph Key, MP. IRENE KRASTEV The Irene Krastev Award is presented by The Migrant Women's Lobby Group of SA Incorporated (MWLG) to recognise women from a migrant or refugee background who have made a significant contribution to the community and to the participation of women in the social, economic and educational life of South Australia. The values that the MWLG seek to recognise, find noteworthy and commend through this award are: community involvement in South Australia; participation in community activities; leadership in women's groups; volunteer work; working with women, individuals and groups; and mentoring individuals and providing support for individuals and groups I was deeply honoured to be this year’s recipient of the award. My congratulations to my co-finalists: Emily Tanui Kori and Monica Belosevic. They have been equally as dedicated and passionate as I have been in my commitment to serve the community. The YOUNG WOMEN’S COMMUNITY AND SPIRIT AWARD was awarded to Atena Abrahimzadeh and Nadia Baldassi- Winderlich. This year’s Governor’s Multicultural Award that was held on 21st of March at the Government House grounds saw 34 finalists and 17 winners. Congratulations to all the winners, among whom was Cynthia Caird who received this year’s award for Community Service – Individual category. I was privileged to have been a finalist to the Art and Culture Award-Individual category. The special Individual Achievement Award was given to Mr Ly Luan Le. Mr Ly Luan Le fled his home country Vietnam in the wake of Vietnam war and found initial refuge in the Philippines. It was in the Philippines where the United Nations High Commissioner for Refugees asked him to develop a curriculum of English language for refugees. He arrived in Australia via a refugee camp in 1982, of which he had a first impression of it being "paradise". He used his own experiences to help refugees and new arrivals. Since his arrival in Australia he has been actively involved in promoting multiculturalism and diversity. "This is the opportunity to congratulate and acknowledge the wonderful work of so many people quietly within our community, that are working day in and day out, to ensure that the benefits of cultural diversity is known." The GRAHAM SMITH PEACE FOUNDATION bagged the award for arts and culture – under the organization category. The foundation was initiated by Leonie Ebert. Celebrating Harmony Day in the afternoon of the same day, the Graham Smith Peace Foundation successfully raised funds via auction at the event. Among the many notables who attended were Stephanie Key, MP, and Lady Mayoress Genevieve Haese who came with her mother who was vacationing from Singapore. The guest speaker was Henry Olango, a retired professional cricketer from Zimbabwe who now calls Australia his home. THE “food bowl” of Northern Adelaide has been backed by the country’s independent infrastructure adviser, following the release of a much-anticipated 15-year plan into the country’s most pressing construction priorities. The support in the Infrastructure Australia report for the centrepiece of the Northern Adelaide’s Irrigation Scheme — an upgraded Bolivar Wastewater Treatment Plant — means that plan to develop the agricultural land between Gawler and Port Wakefield can now move forward. But the going may be slow, after Federal Treasurer Scott Morrison warned the country’s dire budget situation meant states could not expect handouts. The Infrastructure Australia report identified nine infrastructure priorities for the state, all of which had been nominated by the South Australian Government. State Infrastructure Minister Stephen Mullighan declared the release of the plan “great news for South Australia”. The most prominent projects are familiar — an expanded tram network, an upgraded Gawler line and a streamlined North-South road corridor. Six of the priorities address regional needs, including the Bolivar Plant upgrade. “The idea behind that project is to secure a greater amount of water which can be used to irrigate through to production areas to the north of Adelaide,” Mr Mullighan said. State Opposition infrastructure spokesman David Pisoni said his party agreed with the “general gist of the timeline of the projects” including making the Gawler train line upgrade a priority. He also said he was “attracted” to the development of a port on the Eyre Peninsula to help transport mining ore.
SA Property Council Executive Director Daniel Gannon described the plan as a “wake-up call to South Australia’s policy makers” and called for a “pipeline” of projects. Andrew McKenna, Senior Policy Advisor from Business SA, believes the northern Adelaide food bowl, alongside the Strzelecki Track upgrade, are the most important projects for the state’s economy. Although the project has been endorsed by Infrastructure Australia, the Federal Government’s budget deficit means the State Government cannot expect an immediate funding contribution. Federal Treasurer Scott Morrison reiterated his belief that his Government would need cut spending and states would have to manage their own affairs without Commonwealth money. “I don’t think states are branch offices of the Commonwealth — I think they are sovereign governments,’’ he said at a speech in Canberra yesterday. Federal Major Projects Minister Paul Fletcher said his Government would use “a more consistent evaluation of wider economic benefits and a more rigorous and detailed assessment framework” to determine which projects it funds. The plan also recommends for population growth in smaller cities like Adelaide to increase, and a review into the merits of funding infrastructure with higher charges for users of roads. of the Gawler rail line, including installation of a new signalling system, was earmarked as South Australia’s only high-priority project by Infrastructure Australia. The current peak-hour Gawler line load reaches 75 per cent along the busiest sections and network capacity is expected to be reached in as little as five years. Growth in passenger numbers is driven by the population boom in Adelaide’s northern suburbs, including Gawler-Two Wells, Playford and Salisbury. An extra 116,000 residents are expected to move in over the next 15 years. The diesel-powered train fleet and the signalling system on the line are already reaching the end of their reliable service life. A recent infrastructure audit found that the performance of urban roads and public transport is a key challenge for South Australia. This tram upgrade would involve a massive expansion of the network in Adelaide, creating a loop around the city and lines through the inner suburbs north, south, east and west of the CBD. A proposed link to Port Adelaide would also mean the conversion of existing diesel heavy rail to a modern electric light rail service. In Adelaide, the proportion of passengers using public transport for journeys to work is just over 8 per cent, whereas in Melbourne and Brisbane it is 11.5 per cent, and in Sydney it is 17.6 per cent. of the north-south corridor following the recently announced improvements to the Northern Connector and South Rd. It would involve 15km of new motorway along the existing corridor, creating a 78km transport spine across the city. According to the infrastructure audit, sections of the north-south corridor that have not been upgraded experience slow travel times and reduced travel time reliability. South Rd alone is expected to have delay cost of $164 million in 2031 — that is, it will cost an extra $164 million to fix the problem unless investment is made soon. The Strzelecki Track has been identified as a short-term priority by Infrastructure Australia – and not just the road. This project would upgrade and seal 426km of the currently unsealed Strzelecki Track between Lyndhurst and Innamincka, and 26km of the Nappa Merrie Access Rd, providing a sealed connection between South Australia and Queensland. The road is currently unsuitable for heavy vehicles, and suffers from potholes, corrugation and a lack of drainage. But the project also proposes improved mobile phone coverage along the route, which is important to the expanding oil and gas industry. Despite reports of job losses, the SA mining and resources sector continues to grow. The state now has 10 fully operating mines, plus four approved or under construction, as well as more than 20 projects at various planning stages. The lack of a clear transport path, including high-capacity deep ports, can be a hurdle for investment in mining, but at the same time attracting capital for new port projects without financial and contractual commitments from miners is difficult. Infrastructure Australia has earmarked three sites for potential port development: the existing Whyalla Port, the planned Cape Hardy Port on eastern Eyre Peninsula, or the planned Myponie Point export facility on the northern Yorke Peninsula. “High-productivity vehicles” – large trucks — can carry 30 per cent more freight per vehicle, meaning fewer vehicles are needed to move the same amount of freight. Freight growth on the Sturt is expected to increase by almost 2 per cent every year. This initiative proposes an upgrade of the Sturt Highway through the Truro Hills, including a bypass of the town of Truro. It would improve safety and will mean high-productivity vehicles can use the highway. The Gawler Craton is a region northwest of the Eyre Peninsula with extensive copper, gold, silver and iron ore deposits. The remoteness of the mineral deposits has always proved a hurdle for exploration and development. This initiative proposes that a third party builds, owns and operates a 350km railway in the Gawler Craton area, linking to the existing interstate rail network as well as other potential mining projects in future. Development of this rail line could provide a connection to the Prominent Hill, Olympic Dam and Carrapateena mines, and provide access to other potential reserves. The interstate rail freight network in South Australia handles 80 per cent of the land-based east-west intercapital freight market. It is essential for regional mineral and agricultural producers in South Australia. Within 15 years the track will be “capacity constrained”, while some sections of the current track are already close to needing replacement or impose speed and axle-load restrictions. This project proposes upgrades on the Port Augusta to Tarcoola section of the network, while upgrades to the remaining parts of the track are being considered by a national freight strategy. This proposal would expand and upgrade the Bolivar Wastewater Treatment Plant to improve the way it treats and disposes of waste water to comply with new environmental standards. It would also make an additional 20 GL of recycled water available for high value agricultural production in the farming regions north of Adelaide. Groundwater is the major natural resource supporting the existing irrigation area but this is over-allocated. Without this extra water, there are limited opportunities to expand the regional agricultural economy.